The Red Bulls and Crew enter the pitch. Photo by Jason Schott. 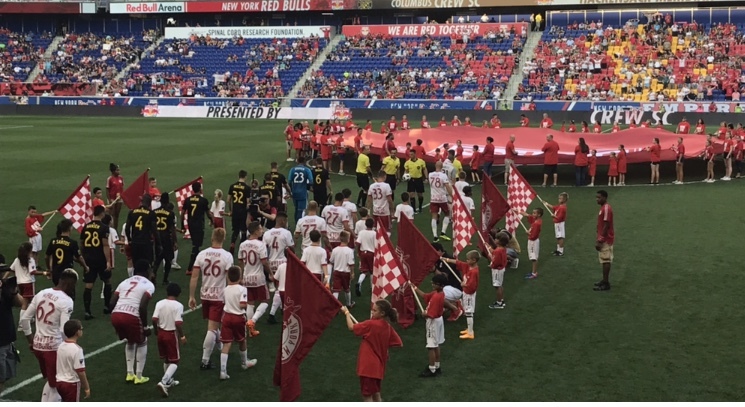 The Red Bulls nearly completed a big comeback in the second half, but they came up short, losing 3-2 to the Columbus Crew on Saturday night at Red Bull Arena. It didn't take long for Columbus to get on the board, as they had a free kick near the corner in the seventh minute. The pass went to Patrick Mullins on the right side of the box and he got it to Jonathan Mensah at the top of the box, and he buried it. In the 24th minute, after Columbus gained control at midfield, Mullins raced down the left side past Red Bulls defender Aurelian Collin, came in alone, and fired a rocket past Red Bulls goalkeeper Luis Robles to make it 2-0. In the 31st minute, Pedro Santos took a corner kick for Columbus, and it went along the back line, and Josh Williams headed it toward the net, and it went off Sean Davis of the Red Bulls and in to make it 3-0 Columbus. That was the score at halftime, and Red Bulls Head Coach Chris Armas sent in Bradley Wright-Phillips and Kaku for Davis and Collin to get their offense going. It didn't take long for Wright-Phillips to make an impact, as he got a feed from Danny Royer in the 50th minute, and headed it off Columbus' Mensah and into the net for the Red Bulls' first goal of the night. The Red Bulls kept the heat on, and in the 69th minute, Kaku came down the right side, and found Royer in the center of the box, and he headed it home to make it 3-2. They had a couple of top chances to tie the game late, as Kaku had a free kick in the 77th minute and fired it just over the crossbar. In the 80th, Royer came down the left side, had an opening at the top of the box, and fired it just over the bar. The Red Bulls remain in third place with the loss, dropping to 13-2-5, with 41 points. They remain two points behind NYCFC, who play at Seattle on Sunday afternoon. Columbus, in fourth place in the East, gained ground on the Red Bulls, as they improved to 10-6-7, 36 points. Red Bulls Head Coach Chris Armas said of the game, "Yeah, look, we looked closely at Columbus in the last few weeks, and a lot of what we looked at was the last time we played them. Our typical 4-3-2-1, and their system and their style of play challenged us on that day. We thought we got exposed at their place that way. "The second half of that game, if I remember, yeah, it was 5-1-3-1, the exact formation we started with tonight and we had to really put things on our terms at their place in that same structure. "Tonight was opposite. Sometimes, yeah, it's hard to explain it but when you're -- no matter what formation that we're playing in, if we're late to plays, a step late, if we're not up for that part of it, they can just pick you apart. "They are probably the best passing team in the League that way, so we were hoping for them to play out of the back and if we were really good on the day, maybe like the second half, it looks one way. So in the end, in the run of play, you know, I'm not sure -- yeah, it was four shots they had in the first half, four shots. They had three shots on goal a night. You know, when you start to really look at it, yeah, it doesn't always feel good when the other ball, but possession ended up being 50/50 I think. Depends on which half we're going to really focus on here because the second half we were really good." Columbus Head Coach Gregg Berhalter said of his team holding on for the win, "It was important. I think the beginning of the game, the first half of the game, we had to make some adjustments based on how they were playing a different system and I think we adjusted really well. We exploited the space in the empty middle and did a great job of keeping the ball and putting them on their heels. "The second half, as they moved back to their traditional system, the focus was now on switching the field and I think we could have been a little more effective, you see the goals, both of them came on examples of when we could have switched field to break pressure off."